It is a great pleasure to welcome John Kearon (back) to London in Prague. 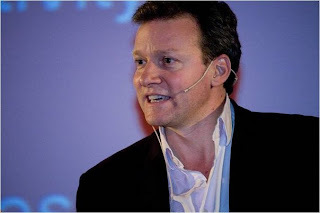 John is the Founder, CEO & Chief Juicer of BrainJuicer Europe's leading online research agency. John was Ernst & Young's 'Entrepreneur of the Year 2005' and the company's innovative approach to research has garnered a number of awards including 'The Most Innovative Use of IT' and 'Service Business of the Year'. Most important of all, John is passionate about innovation - innovation of marketing and market research techniques. The workshop with John will take place on 10th of November at Long Tale Café, Osadní 35, Praha 7. We will start at 10am and we aim to finish at 3pm. Group excersise: creating real case in Czech Republic where we put to practice the principles of co-creation, crowdsourcing and "we research". We will select 1 or 2 cases at the end and we will put make them happen! Looking forward to see you in Long Tale Café on the 1oth of November! Londýn v Praze je symbolické místo, kde díky tvůrčím schopnostem a různorodosti zúčastněných vznikají myšlenky bez hranic. Londýn v Praze představuje lidi z oblasti marketingu, reklamy a designu, kteří svou prací radikálně mění realitu značek, výrobků i prožitků spotřebitelů. Londýn v Praze je projektem společnosti Perfect Crowd. Perfect Crowd společně s Ogilvy CR organizují pod hlavičkou Londýn v Praze setkání, přednášky, workshopy a konference.